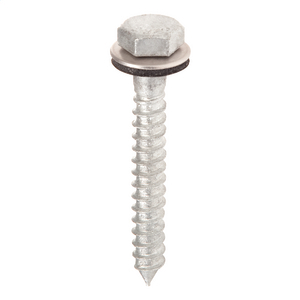 Hex head lag screw with neoprene cushioned steel washer for securing composite cable guards. Square head lag screw, 1/2" diameter fetter thread x 3" long with drive point and upset shoulder. Thread length is 2 1/4". Galvanized per ASTM A-153. Square head lag screw, 1/2" diameter fetter thread x 4 1/2" long with drive point and upset shoulder. Thread length is 3". 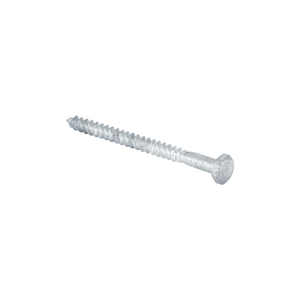 Galvanized per CSA G164-M.
Square head lag screw, 1/2" diameter fetter thread x 4 1/2" long with drive point and upset shoulder. Thread length is 3". Galvanized per ASTM A-153. Square head lag screw, 1/2" diameter fetter thread x 4" long with drive point and upset shoulder. Thread length is 2 1/2". 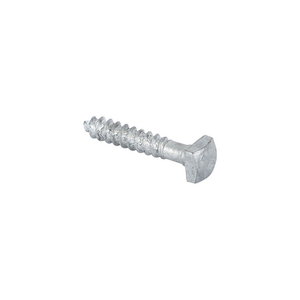 Galvanized per CSA G164-M.
Square head lag screw, 1/2" diameter fetter thread x 4" long with drive point and upset shoulder. Thread length is 2 5/8". Galvanized per ASTM A-153. Square head lag screw, 1/2" diameter fetter thread x 5" long with drive point and upset shoulder. Thread length is 3". Galvanized per ASTM A-153. 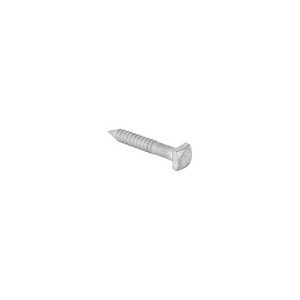 Hex head lag screw, 1/2" diameter gimlet thread x 4" long with regular point. Thread length is 2 5/8". Galvanized per ASTM A-153. 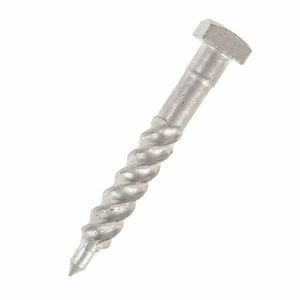 Square head lag screw, 1/2" diameter twist drive thread x 4" long with drive point and upset shoulder. Thread length is 2 5/8". Galvanized per ASTM A-153. Square head lag screw, 1/4" diameter gimlet thread x 1 1/2" long with regular point and upset shoulder. Thread length is 1 1/8". Galvanized per ASTM A-153. Square head lag screw, 1/4" diameter gimlet thread x 2 1/2" long with regular point and upset shoulder. Thread length is 1 3/4". Galvanized per ASTM A-153. Square head lag screw, 1/4" diameter gimlet thread x 2" long with regular point and upset shoulder. Thread length is 1 1/2". Galvanized per ASTM A-153. Hex head lag screw, 1/4" diameter gimlet thread x 3" long with regular point and upset shoulder. Thread length is 2". Galvanized per ASTM A-153. Square head lag screw, 3/8" diameter fetter thread x 2 1/2" long with regular point and upset shoulder. Thread length is 1 3/4". Galvanized per ASTM A-153. Square head lag screw, 3/8" diameter fetter thread x 3" long with drive point and upset shoulder. Thread length is 2". 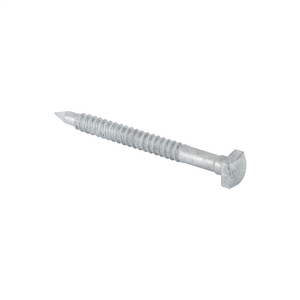 Galvanized per CSA G164-M.
Square head lag screw, 3/8" diameter fetter thread x 3" long with pilot point and upset shoulder. Thread length is 2". Galvanized per ASTM A-153. Square head lag screw, 3/8" diameter fetter thread x 4" long with pilot point and upset shoulder. Thread length is 3". Galvanized per ASTM A-153. Square head lag screw, 3/8" diameter fetter thread x 4" long with drive point and upset shoulder. Thread length is 3". 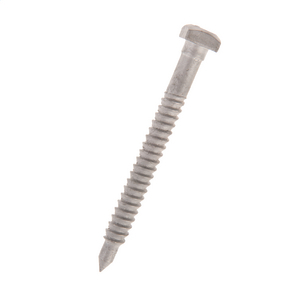 Galvanized per CSA G164-M.
Hex head lag screw, 3/8" diameter gimlet thread x 3" long with regular point. Thread length is 2". Galvanized per ASTM A-153. Hex head lag screw, 5/8" diameter gimlet thread x 4 1/2" long with regular point. Thread length is 4". Galvanized per ASTM A-153.